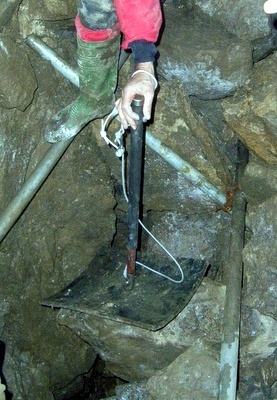 The first version of this article was published in the UK Caving Forum wiki. Capping is a technique used for splitting rock by discharging one of more nail gun cartridges within a drilled hole. It is a particularly useful method for splitting boulders into a manageable size, and may also be used, albeit less effectively, to trim bedrock. 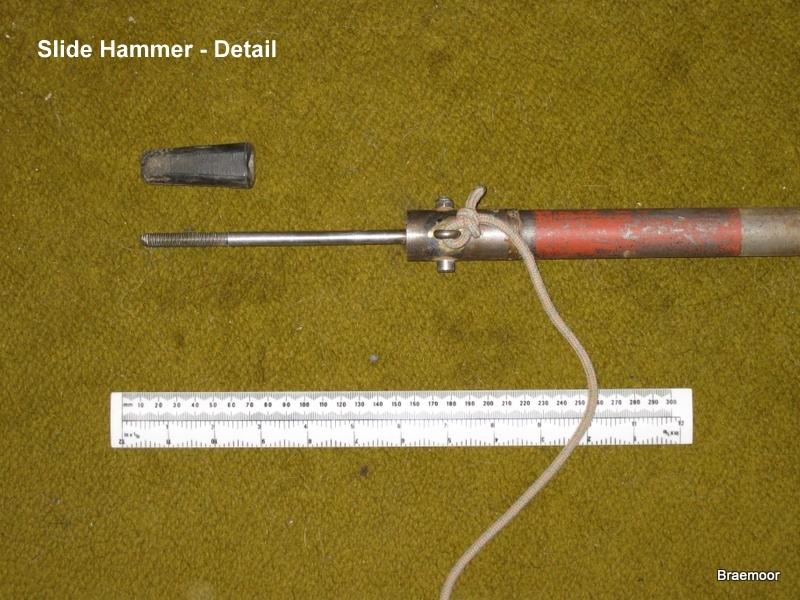 The basic technique is to drill an 8 mm hole to the required depth, insert one or more cartridges into the bottom of the hole, and to explode the cartridges by striking the top cartridge with a firing pin. 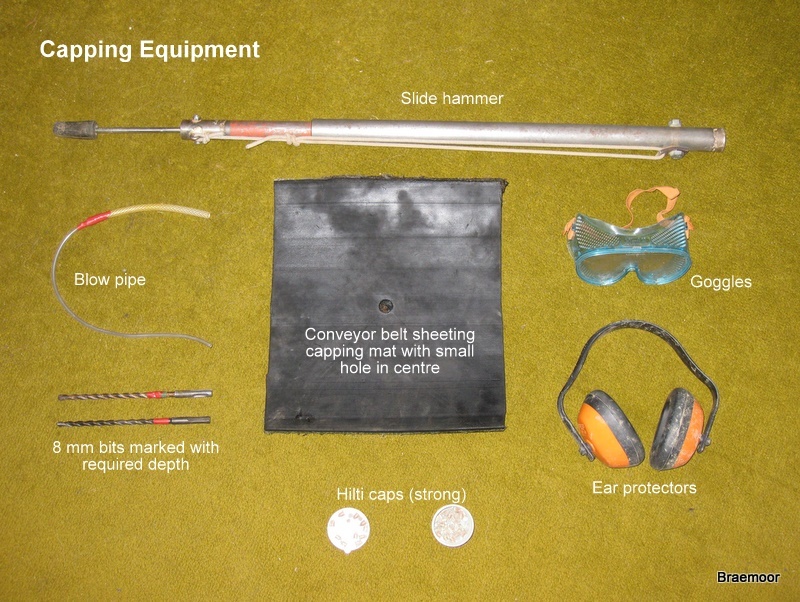 Although capping is an effective technique, it is also particularly hazardous when performed with the wrong tools, or incorrectly or carelessly with the right tools. This article was a response to a number of videos on YouTube showing cavers capping, which demonstrated poor and dangerous practices. The caps can explode prematurely if inserted in the hole carelessly, and expelled with great velocity. The firing pin can be ejected from the drilled hole at a velocity sufficient to penetrate flesh. Fragments of rock shoot off in all directions, again at a velocity sufficient to penetrate flesh. Gases from the exploded caps are noxious (although not produced in great quantity). They include oxides of nitrogen, oxides of carbon, oxides of lead, metallic lead and acrid fumes. The sound of the cap exploding in a confined space can be sufficiently loud to damage the ears. The larger lumps of fragmented rocks can fall on badly positioned limbs. Drill and 8 mm bits: The bits should be marked so that holes are drilled for the correct length. This will normally be the length of the firing pin less the thickness of the capping mat. Caps: These come in a variety of strengths, and the stronger ones are obviously more effective (such as the Black Hilti cartridges, or the Red cartridges from Spit). The latter have the advantage of being a slightly smaller diameter and slide easily into an 8 mm hole without risk of jamming. They should be transported in waterproof containers (such as pill boxes) which have been padded to prevent them from rolling about and losing their powder. 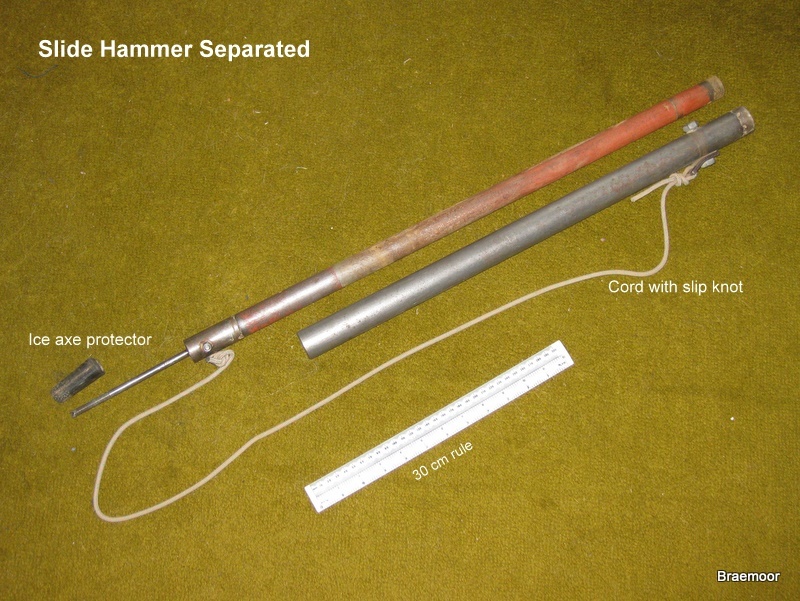 Slide Hammer (see below): The best ignition tool is a long slide hammer with the firing pin fixed to the end. This allows the caps to be fired from a safe distance, and the weight prevents the firing pin from being expelled. Capping mats: The pin should be inserted through a mat intended to contain the blast. The best mats are made of conveyor belt material, and should be a minimum of 30 cm square. These are effective at confining the blast without being damaged. Conveyor belting is, however, inflexible and cannot always be used. A second best is to use a 50 mm square of conveyor belting next to the rock with carpeting on top. The belting prevents the carpet from getting too damaged, and the the carpet should provide adequate shielding from fragments. Note that in both cases, the firing pin is inserted through the middle of the capping mat. Blow pipe: To empty the hole of excess dust which could absorb the impact of the firing pin. Goggles: To protect your eyes from any ricocheting fragments. Ear muffs or ear plugs: To protect your ears from the sound of the ignition in confined spaces. Gloves: To protect your hands from any ricocheting fragments. It should be clearly understood that when used carelessly, capping is objectively dangerous. Every firing should be taken seriously, and undertaken methodically following established procedures. Accidents will happen when the operator becomes blasé. Drill a hole in the centre of your boulder with an 8 mm bit to the depth dictated by the length of your firing pin less the thickness of your capping mat. This should be about 12 cm long. The bit should be marked so no guess work is involved. Note that shallow holes are dangerous as the blast-back is a lot more severe. If the maximum depth of a hole that can be drilled in a boulder is, say 15 cm, the hole should be drilled to the full depth rather than half-way. Empty the hole of dust using the blow pipe (you needn't be too finicky). Insert the caps. For a smaller boulder, one will usually do. For a larger boulder two may be required. For bedrock three may be required, but no more than three should be used. In general, use the minimum number of caps - this will lessen the noise, the fumes, and the flying fragments. Ensure any helpers move well back, and the drill and bits are set well to one side. Ensure gloves, ear muffs, and goggles are all in place, and that your legs are not under the boulder. You should assume that an accidental firing is possible during the next stage, so you should be positioned as far from the boulder as possible. Choose the best capping mat for the situation, only selecting the the more flexible one when the less flexible one cannot be positioned so as to provide adequate protection. Push the tip of the firing pin through the capping mat. With the capping mat inserted over the firing pin, push the cap(s) gently to the base of the drilled hole. Treat gently so as to avoid premature firing. After warning your colleagues, strike the firing pin firmly and sharply with the slide hammer, and firing should occur. Rarely, a cap may fail to detonate. This could either be because the cap is dud, or because the hole is too deep for the firing pin to fully penetrate. This is potentially dangerous, as if it is left and care is not taken, it could be fired accidentally whilst drilling a second hole. In the first instance, another cap should be inserted as above, and a further attempt made to detonate the cap. If this fails, a second hole should be drilled such that it cannot intercept the previous hole, and the boulder split. Care should then be taken with the debris until the unexploded cap has been located. If the location does not have a healthy draught, fumes can build up. The area should be vacated if this happens until the fumes clear, or the air replaced from a diving cylinder. 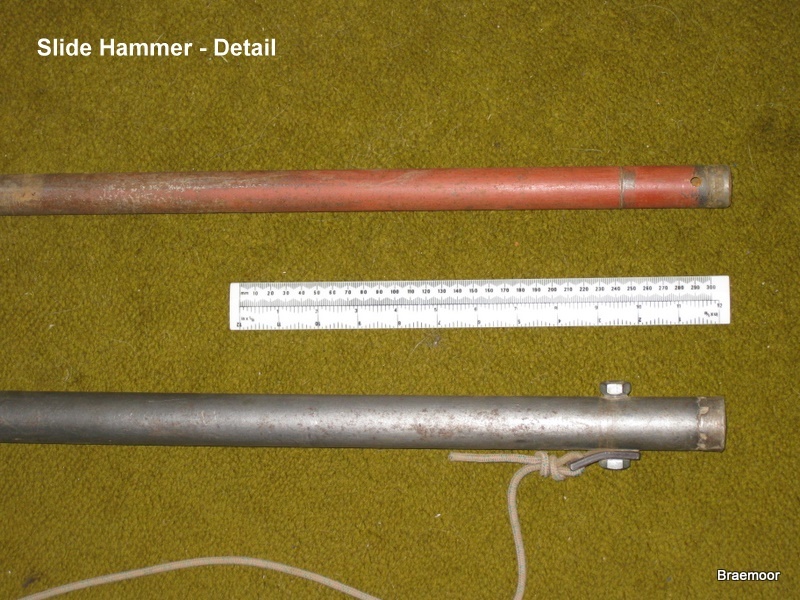 The slide hammer (aka "pogging bar") consists of two sections - an inner tube with the firing pin attached to the base, and a heavy outer tube, with caps welded to the top of both. At firing time the outer tube is slammed down over the inner tube, transferring energy to the firing pin. Both tubes need to be seamless to ensure that one slides smoothly over the other. The firing pin is made of the tough Maraging steel, and the tip has to fit an 8 mm hole fairly snugly. The end should be chisel shape, preferably with a notch in, to ensure that as much pressure as possible is applied to the rim of the cartridge, and the lower section should be threaded to allow dust to be trapped to help seal the hole. 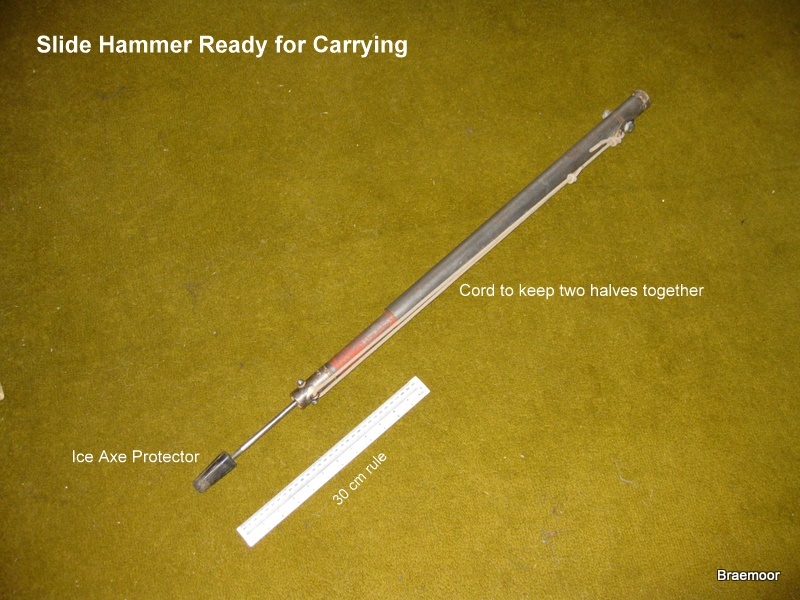 The firing pin should be protected during transport with something like an ice-axe protector. Cord can be used to fasten the inner tube to the outer tube. This can be tightened when being transported to keep the hammer in one piece, and slackened when firing.